This is the perfect place to call home in beautiful Cabezon! 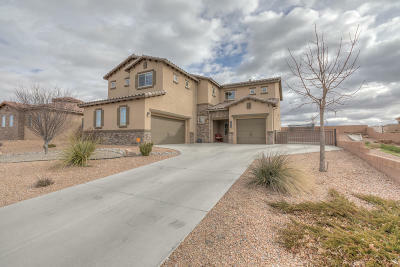 This is a stunning 5 bedroom home with a bedroom and 3/4 bath downstairs. The expansive master suite has a sitting room with a balcony that overlooks the beautiful Sandias! The master bath also has separate his and hers walk-in closets. 3 additional bedrooms, loft area, guest bath and laundry room complete the upstairs. You will love cooking in the gorgeous kitchen with a HUGE walk-in pantry. Entertain in and enjoy the fully landscaped backyard complete with a wood burning fireplace and built in grill. DIRECTIONS: From Cabezon Blvd Turn North Onto Vista De Colinas. Turn Right Onto Cipres Ln. Make A Left Onto Cereza Dr And Home Will Be On The Right.